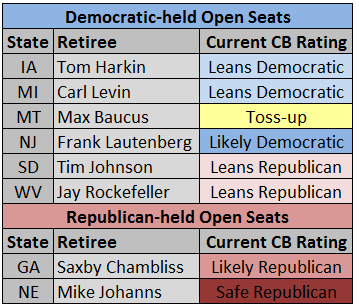 Baucus retiring has prompted us to move this race from “leans Democratic” to “toss-up,” but if Schweitzer runs for the seat, he will start as the favorite. It is quite possible that Schweitzer would have defeated Baucus in a primary, and polling has indicated that Schweitzer probably would be a better general election candidate than Baucus. Baucus has been in the Senate for 35 years; there would have been a lot of ammo in the record for his opponents to use. 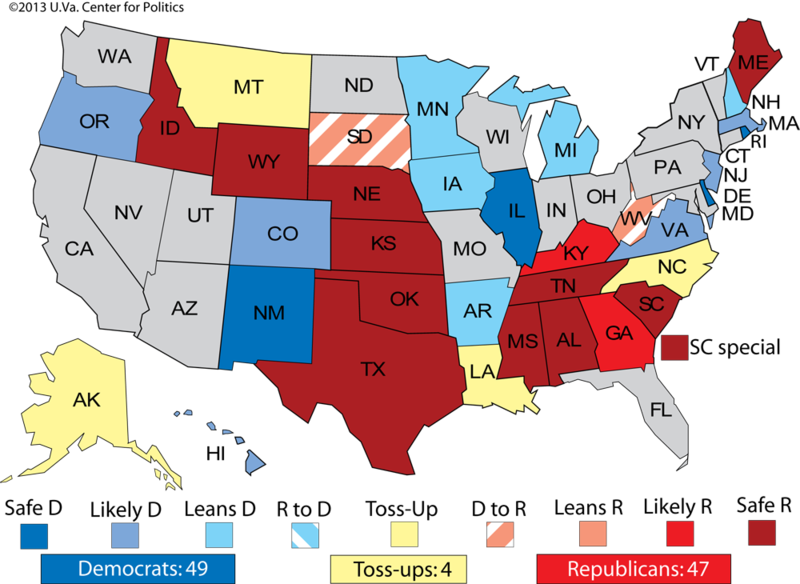 If Schweitzer does not run, then this race will probably tilt at least slightly to the Republicans. The trouble for both sides is a thin bench. Unproven Republicans already in the field include a couple of little-known state legislators, state Rep. Champ Edmunds (R) and ex-state Sen. Corey Stapleton (R), while newly-elected Rep. Steve Daines (R) is reportedly considering a bid. Among others, former Gov. Marc Racicot (R) may also be contemplating the race. Racicot was once dominant in Montana politics, but he has been out of office since early 2001 and has made his living as a big-time D.C. lobbyist and association head — not an especially popular perch from which to launch a Senate candidacy. Just ask Tommy Thompson (R), the popular governor turned failed 2012 Senate candidate in Wisconsin. Potential non-Schweitzer Democrats include Montana Superintendent of Public Instruction Denise Juneau (D), a Native American, and EMILY’s List President Stephanie Schriock (D), who managed Sen. Jon Tester’s (D-MT) successful 2006 campaign (EMILY’s List is a liberal group that backs female candidates). We rate Iowa and Michigan as “leans Democratic” partly because Democrats have rapidly rallied around solid candidates for their nominations: Reps. Bruce Braley (D-IA) and Gary Peters (D-MI). Meanwhile, Republicans don’t yet have a top candidate in either state, although there’s plenty of time and many names are bubbling up in both places. One who won’t run, though, is Lt. Gov. Kim Reynolds (R-IA), and it’s also looking less and less likely that fire-breathing Rep. Steve King (R-IA) will contest the seat, either. Michigan’s Republican nomination could go to Reps. Mike Rogers or Justin Amash. If they fought each other in a primary, it would be a classic insider (Rogers, the House Intelligence Committee chairman) versus outsider (Amash, a libertarian and relatively fresh face) battle. Hanabusa’s primary challenge should activate the old Inouye machine against Abercrombie and Schatz. However, the Democratic Senatorial Campaign Committee supports Schatz, though it is doubtful the DSCC will spend any money there. Schatz, as the incumbent in a state that values incumbency and has recently lost a massive amount of it, starts with a small advantage in the primary, but he’ll have to work very hard to fight off the Hanabusa challenge, which is backed by EMILY’s List. It’s worth noting that Hanabusa has not shown much general election strength in the very Democratic Aloha State: She ran 15 points behind President Obama, for instance, in her congressional race last fall. Granted, Obama has superhuman appeal in the state he was born, but the result does not reflect well on Hanabusa. Yet her status as the female Asian-American candidate could benefit her in the primary because she fits the demographic profile of the state and Hawaii’s Democratic primary electorate much better than Schatz. The Schatz-Hanabusa matchup is the latest in a long line of racially-tinged Hawaiian Democratic primary tilts, which the Asian-American candidates have often won. On the Republican side, Hanabusa’s opponent in 2010 and 2012, ex-Rep. Charles Djou (R), could make a compelling general election candidate. He would be a longshot, but there’s a reason we’re calling this race “likely Democratic,” not completely “safe,” in the general election. The map below shows the overall Senate picture. Republicans, at this point, are favored to take two seats — South Dakota and West Virginia — but they would need at least four more seats to win control of the U.S. Senate. 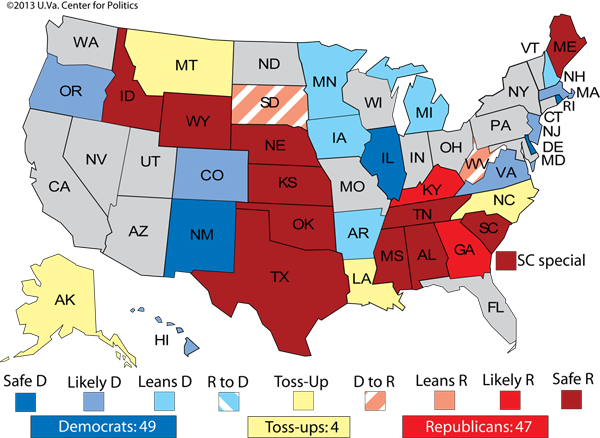 As of May 2013, the Republicans are likely to reduce the Democratic edge in the Senate, perhaps substantially, but it is too soon to predict their chances for a six-seat net takeover.